The pancreas has many functions, including the production and secretion of digestive enzymes and the production of insulin. Digestive enzymes are critical for the absorption of food. Insulin aids in the control of the metabolism and blood-sugar levels. Pancreatitis refers to “inflammation of the pancreas” and there are two types of this disease: chronic, which means “recurring,” and acute, which means “sudden.” When the pancreas becomes inflamed, digestive enzymes that are normally inactive until they reach the small intestine become activated in the pancreas instead, resulting in pain and swelling as the pancreas actually begins to digest itself. Dogs with chronic pancreatitis essentially have multiple attacks of acute pancreatitis. In some situations, the symptoms can be less severe but because the condition is chronic, the long-term impact can be more severe. The pancreas is located in the upper abdomen, near the stomach, liver and right kidney. There are many suggested causes of pancreatitis including obesity, high-fat diets, liver disease, certain medications, toxins, and infection. Even if your dog doesn’t normally eat a high-fat diet, the introduction of a large amount of fatty food all at once can cause pancreatitis. 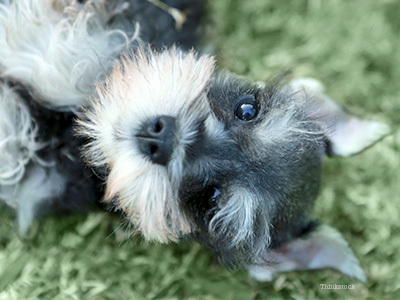 Pancreatitis can occur in any dog but some breeds are more susceptible to this disease than others, including the miniature schnauzer, miniature poodle, and cocker spaniel. Additionally, pancreatitis is more common in older dogs, overweight dogs, and females. Dogs that get into garbage are much more likely to develop pancreatitis, so be sure to keep trash out of your dog’s reach! Dogs with pancreatitis will often stop eating and drinking because of the pain associated with this disease. Keep in mind that your veterinarian may recommend that some diagnostic tests—such as the CBC, chemistry tests, and pancreas-specific tests—be repeated to monitor your dog’s progress during treatment. Your veterinarian will recommend a treatment plan that is specific for your pet. Make sure you give all medications as directed and carefully follow any dietary recommendations. Keep a close eye on your best friend; if she becomes lethargic or stops eating, call your veterinarian right away. Feed your dog a diet recommended for the prevention of pancreatitis. Don’t let your dog become overweight—weight management is just as important for our four-legged friends as it is for us! Avoid giving your dog table scraps, especially if she isn’t accustomed to eating people food. Make sure you discuss all medications for your dog with your veterinarian. They will help you avoid any unnecessary medications that may cause pancreatitis. Don’t let your dog have access to garbage! Want more info? Learn about acute pancreatitis in dogs.